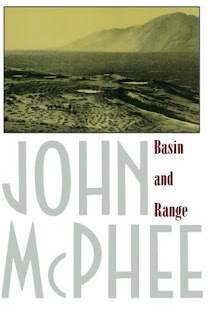 John McPhee is considered one of the pioneers of creative nonfiction. In 1978 he started a set of journeys across America with geologists that turned into a series of five books published over twenty years. Basin and Range is the first book in the series and mostly concerns the geological landscape from eastern Utah to eastern California. Rather than produce a straight science narrative about the geology of the region, or a conventional history of the science of geology, McPhee instead travels with geologists to explore and write about the landscape. The result is a rather eclectic set of stories and observations about the science of geology, the rocks visible in the landscape and hidden underground, the nature of time and the history of the geologic time scale, the unfolding of the theory of plate tectonics, and the work of geologists. In this sense, it seeks to create a discussion of geology that might appeal to the non-geologist and geologist alike; to create a kind of geo-prose that ruminates on the long history of the development of the Earth’s surface. For the most part, he creates an interesting set of reminisces and thoughtful reflections, though occasionally it loses focus and seems to drift, lacking a clear direction or purpose. Overall though, it’s an engaging read.